When the Left had proposed Pranab Mukherjee’s name for the post of President in 2007, the Congress had argued that the veteran leader could not be spared given the indispensable role he played in the party and the government. Now that Mukherjee has been declared the UPA’s candidate for next month’s Presidential election, Congress leaders are taking the plea that questions like “After Nehru, Who” were also posed in the past, but the party and the country survived the loss. There is no dearth of talent in our party, say Congress leaders. Described variously as a man for all seasons and the party and government’s chief troubleshooter, Pranab Mukherjee has held three important portfolios of Defence, External Affairs and Finance in the last eight years. He has headed as many as 83 GoMs and EGoMs to resolve ticklish policy issues that get bogged down in inter-ministerial wrangling. As Lok Sabha leader, it was his job to negotiate with a combative Opposition to ensure that Parliament functioned smoothly and official business did not get stalled. More importantly, Mukherjee was inevitably called in to douse political bonfires like the Telangana issue. Given the different hats Pranab Mukherjee has donned, it is only legitimate that questions should be asked about who will now fill his shoes. The first big challenge before the PM is to find a new Finance Minister. This job has acquired urgency in the face of a sluggish economy, rising inflation, weakening rupee and dipping investor confidence. Although there are many contenders for this coveted job, indications are that the Prime Minister may take charge of this ministry for some time. For all his other qualities, Mukherjee was considered a conservative Finance Minister while India Inc is looking at a person who will be more in sync with the changing economic scene. The PM has, so far, been constrained from intervening in the finance ministry because of Mukherjee’s seniority. Once he moves to Rashtrapati Bhavan, the PM can take some far-reaching decisions by drawing on his knowledge and past experience when he had rescued the country from an economic crisis in the 90s with the introduction of reforms. Commerce minister Anand Sharma, who has been pushing for liberalisation in FDI and improved trade ties with Pakistan, is eyeing the job, but may not make the cut because of lack of experience. Rural Development Minister Jairam Ramesh is another contender but has acquired the reputation of being “anti-development”. 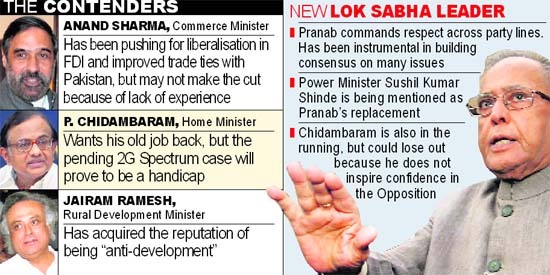 Home Minister P. Chidambaram also wants his old job back but the pending 2G spectrum case will prove to be a handicap. Besides finding a new Finance Minister, Congress president Sonia Gandhi will also have to zero in on a new Lok Sabha leader, a job which was handled admirably by Mukherjee as he commands respect across party lines. Mukherjee had the ability to reach out to political opponents in search of a consensus. Although there is nobody in the same league as Mukherjee, Power Minister Sushil Kumar Shinde is being mentioned as his replacement in the Lok Sabha as his low-key and smiling demeanour will be acceptable across the political spectrum. Chidambaram is also in the running but could lose out because he does no inspire confidence in the Opposition. Finding replacements for Mukherjee in the GoMs (he heads 24 at present) may not be a major issue as the task will be apportioned to the next senior minister, but the party and the government will need a crisis manager in his place. While AICC general secretary Digvijay Singh is expected to step in to resolve the party’s political skirmishes, Defence Minister AK Antony will have a larger role to play in handling sensitive matters and dealing with senior allies like DMK chief M. Karunanidhi.